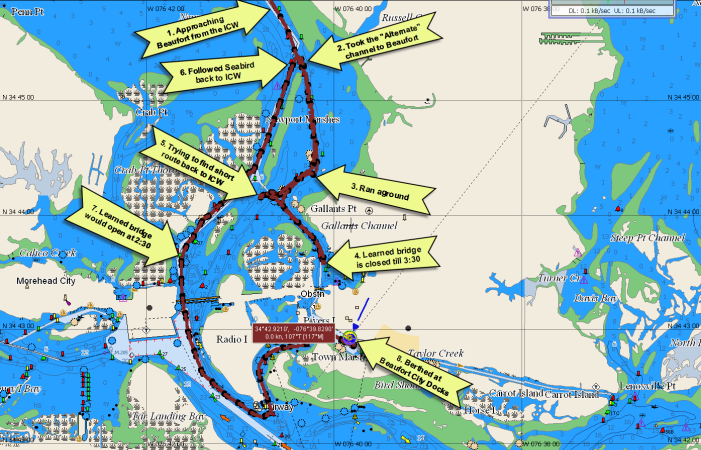 The initial step in the 2008 cruise to the Bahamas was moving Sarah from her berth on the Patuxent River to Beaufort, NC from where Steve and I will depart off-shore. 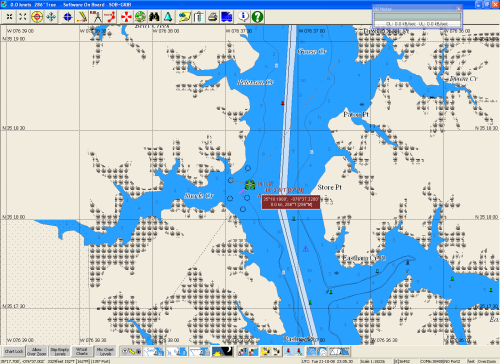 We used the Chesapeake Bay and the Intra-Coastal Wateray (ICW) for this portion of the cruise. Sailing South of Smith Pt. We departed Town Creek on the Patuxent River around 5:30 AM on October 18, 2008, and headed down the bay in a fresh 15 kt breeze. We had originally planned to leave the day before, however the weather forecast predicted gale force winds on the Albemarle Sound in 2 days, when we would have been in position to make our crossing. The Albemarle can be a very nasty body of water in any wind over 20 kts. Rather than rush down to the Albemarle and then sit there for a day or two, we delayed out departure. During the day the breeze continued to freshen. By the time we were south of the Potomac River the winds were over 25 kts. This was not a major problem as the wind was out of the north and we were sailing down wind. By the time we were approaching Norfolk harbor the winds were over 30 kts and the Coast Guard announced a gale warning for the southern Chesapeake Bay. We entered Norfolk harbor in that gale and quickly turned into Willoughby Bay. Willoughby Spit provides good protection from the north and east so this looked like the best anchorage available in these conditions. We set the anchor close enough to the spit to provide some protection should the wind veer to the NW. After monitoring our position for a half hour to insure the anchor was holding we settled in for the night. Steve re-heated the pot roast I had prepared and froze prior to our departure. Although the boat was swinging a bit on the anchor in 20-30 kts of wind we went to sleep that night feeling reasonably secure. Around midnight I woke up and re-checked our position and we hadn't moved more than a few feet. I went back to sleep confident the anchor would not drag. Around 2:00AM Steve woke me up saying he thinks we had dragged. My initial response was, "I had checked our position and we have not moved." Steve persisted that the boat's motion was different and we seem to be in a different position relative to the other boat anchored in the bay. I then noticed that the wind speed had increased to 25-35 kts and Sarah was rocking a lot more than when I was last up. So I reluctantly got up checked our position. Sure enough we had dragged as shown on the chart on the left. We had dragged not a little bit, but over 1,500 feet! The prudent thing at that time would have been to go on deck, start the engine, pull up the anchor and reset back closer to the spit. That was not an appealing choice as it was very dark and very cold out there. During the time we were discussing the options I noticed that Sarah's position as reported by the GPS had not changed by even a 1,000th of a minute of latitude (about 6'). I kept monitoring the GPS position for a half hour and still it had not changed. It appeared the anchor had re-set and was holding in the new position. We cautiously got back in our berths. I left the chartplotter on so I could monitor our position during the rest of the night. I woke up repeatedly until it was nearly light and checked that we still had not moved. By morning it was clear the anchor would hold as long as the wind did not increase further or did not change direction significantly. Although we had planned to move closer to Albemarle that day we decided leaving a secure anchorage in a gale was not the most prudent of actions. So we stayed put in Willoughby Bay the entire day, Sunday. By evening the wind had died to around 20kts. The next morning we got underway shortly before dawn and motored down the channel past Hampton Roads and the docks were most of the U.S. Navy Atlantic Fleet is berthed. Over Taken by Container Ship As we continued down the channel toward the Elizabeth River and the ICW this large container ship entered the harbor. The container ship passed us, then slowed down and two tugs maneuvered along side. It looked to me that the tugs were pushing the ship toward the docks on the far side of the channel, so we started to pass the ship on its starboard. By the time we were nearly passed it became apparent the ship and the tugs had picked up speed and were moving to toward the docks on Sarah's side of the channel. About the time I realized this the pilot onboard the container ship issued 5 long blasts on the ship's horn announcing that we were on a collision course and Sarah needed to change course. Taking the Stern of the Container Ship We immediately turned 180 degrees and passed around the stern of the ship then continued down the channel on the port side of the ship. There never was a real danger as we were starting to changed course before the warning came from the ship and we were never close to a collision. However I felt a little stupid as I have an AIS receiver and knew the name and call sign of the ship. I could have easily called the pilot as we approached and requested passing instructions. The pilot would have told us to pass on the port side. While proceeding through the harbor we passed a large number of schooners leaving the harbor. This must have been the fleet from the "Great Schooner Race", which I believe is held every year on the Chesapeake - right after the Sailboat Show in Annapolis. They race from Annapolis to Norfolk. I suspect their departure from Norfolk had been delayed for several days by gale. Running Up the Elizabeth River Finally we entered the Elizabeth River and the ICW, the first bridge of the day was the Jordan Bridge in Chesapeake, VA. This bridge is scheduled to be de-commissioned on Nov 8, 2008 so we would be among the last boats to request it to open. Then we passed through the Gilmerton Bridge, which then opened on demand - except during Rush Hours. The complication with the Gilmerton Bridge is the Norfolk & Southern railroad bridge right next to it. The railroad bridge closes based on train traffic and when it is closed the Gilmerton Bridge is closed as well. The rest of the bridges on this portion of the ICW have restricted openings. They are all closed for rush hours and most open only on the hour and/or half-hour during the rest of the day. They open on demand during the night, but only commercial craft normally travel the ICW at night. On the right is the Dominion Avenue (AKA Steele) Bridge in Chesapeake, VA. This bridge is most restrictive as it opens only on the hour. It is very difficult for the 35' - 45' cruising sailboat or trawler to time this bridge, and almost everyone has spend a 1/2 hour or more waiting on the Steele Bridge openings. The Steel Bridge was the last of the bridges in the Norfolk area. By early afternoon we passed through the locks at Great Bridge. Our objective for the day was to get as close to the Albemarle Sound as possible so we could cross it early the next day. We pushed the limits of daylight and we dropped anchor off Broad Creek on the North River just at the end of dusk. We achieved our goal, we were less than a mile from the Albemarle. The next day we were underway once more before dawn and entered the Albemarle at about sunrise. The wind was now out of the SW at 15 kts so we had head winds and head seas on the crossing. That slowed us to less than 7 mph during the crossing, however the seas were very manageable. Many of the power boaters crossing at the same time were not so comfortable and there was a lot of complaining about the wind forecast on the VHF radio. On the other side of the Albemarle we entered the Alligator River, where I once again put Sarah aground at the entrance. This was just a brief pause as Sarah slid back off the bar and into deep water, but someday I've got to remember to give those marks a wide berth. After the Alligator we entered the Alligator-Pungo Canal, then down the Pungo River and across the Pamlico River into Goose Creek where we anchored for the night. 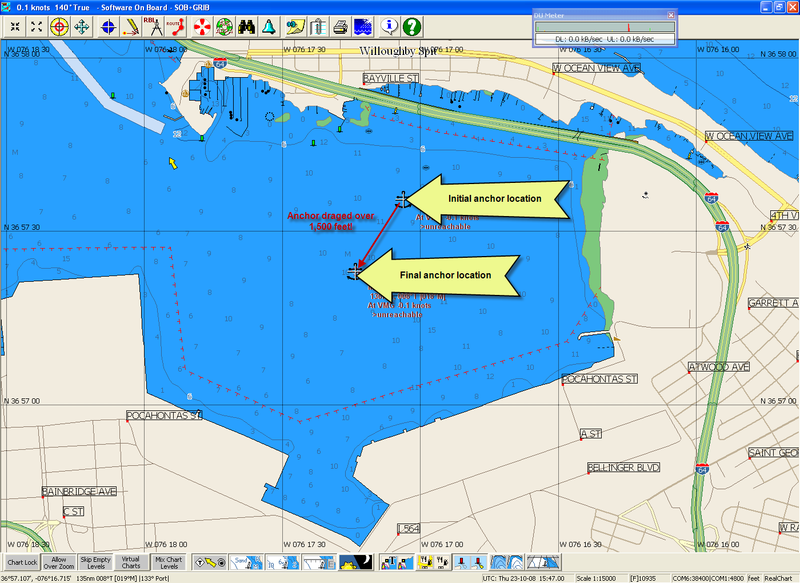 This anchorage is shown in the chart on the right. One of the surprising things on this trip down the ICW was the quality of the cell phone connections possible even in very remote locations such as Goose Creek. I use the Verizon Wireless Broadband service for my internet access. At the dock back in Town Creek I was lucky to get 2 bars on the signal strength indicator. Here you can see I have 4 solid bars in Goose Creek. On the 2004 ICW trip I also used the Verizon service, but internet connection was not possible anywhere in North Carolina. Slowly the USA is starting to catch up to the rest of the world in cell phone service. We're still 3rd world in this regard, but I think we're ahead of a few countries in Sub-Sahara Africa. The main reason we were pushing it so hard to get to Beaufort as quickly as possible was that Steve was trying to save as many vacation days as possible for the off-shore trip. He had already lost one day in Norfolk to the gale. He had a reservation on a flight out of New Bern, NC on Wednesday evening. So we needed to get from Goose Creek to Beaufort, a distance of about 50 miles, before 4:00 to give him a chance to catch that flight and not lose another day. The 50 miles was very doable in that time frame, but we still pushed it hard on Wednesday to get to Beaufort as soon as possible. The only time Steve wanted us to slow down was when we were passed by Showtime in the Adams Creek canal just above Beaufort. Steve fell in love with this boat when it first passed us in the Alligator River. They likely stopped in a marina that evening and were only now catching up to us again. Showtime Showtime is a beautifully restored and maintained Trumpy yacht. Trumpy usually referred to these yachts as houseboats. Not what we would call it today. This is a 1972 Trumpy and therefore must have been one of the last. When I first visited Annapolis in 1971 Trumpy was still in business on Spa Creek. Trumpy closed in the 1970s and according to the Trumpy Yachts website only 3 other Trumpys were built after Showtime (nee Sinbad). The Showtime website (now removed - so it has likely changed hands and possilbly name) said the boat was built in 1969. Here is a link to my webpage of pictures of Annapolis in the 1970s showing in the background what I believe is the the old Trumpy yard shortly after or before it closed down. Today this space is occupied by a number of marine-related businesses. By 12:00 we had exited the Adams Creek Canal and were approaching Beaufort. What happened over the next 3 hours can only be described as a complete SNAFU. The map and annotations above document the series of miss-adventrures. 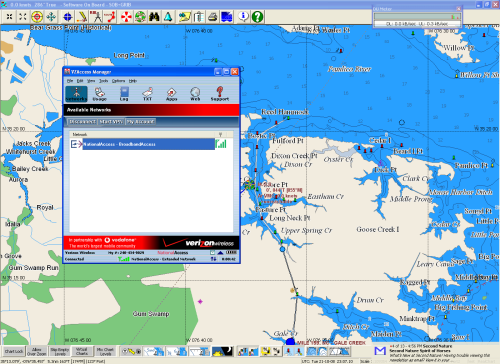 As we approached Beaufort the map showed three channels from the ICW to Beaufort. 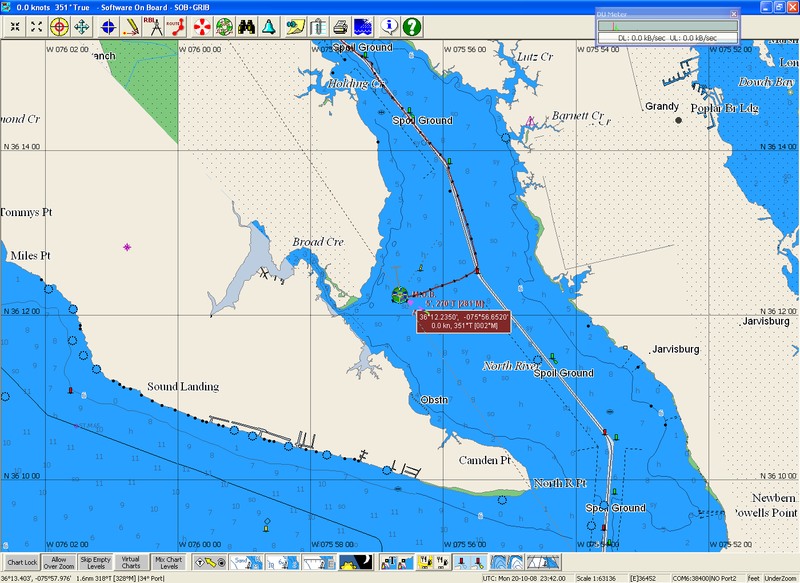 The long way is to follow the ICW through the Morehead City bridge, down around Radio Island and back north to Beaurfort. The map also shows two normally quicker routes. The main route goes to the east just below the Newport Marshes the alternate route goes east just above the marshes. In 2004 the main route was closed due to silting. Four years later I would have assumed that route had been dredged and was once more open; however I hadn't determined if that had happened so we took the alternate route as we had done in 2004. In 2004 we found the channel marks on the alternate route confusing. This time we were even more confused and managed to run Sarah out of the channel and aground. Not a big problem as we quickly backed Sarah off the shoal, found the correct marks and continued toward Beaufort. Both of the shorter routes to Beaufort go through the Beaufort-Radio Island bridge, which is a Bascule bridge that normally opens on the hour and half-hour. By the time we had the bridge in site it was 13:10 so we had another 20 minutes before the next opening. So we slowed Sarah to idle speed and slowly approached the bridge. There are usually a lot of small fishing boats anchored in the channel above the bridge, which makes maneuvering a little difficult. We wanted to stay away from the bridge until close to the opening time. However as we got close we could see that there was construction going on the bridge. I called the bridge tender on the VHF radio to confirm that the bridge would open at 13:30. The bridge tender responded that the bridge was closed until 15:30. 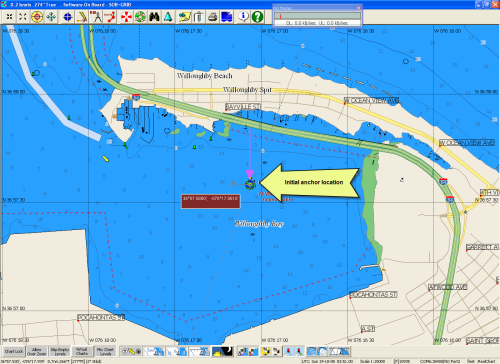 We didn't want to just hang around for 2 hours and Steve had a taxi scheduled to pick him up at the docks at 15:30, so we turned around intending to go back to the ICW and the route around Radio Island. We hoped to not go all the way back north to where the alternate route joins the ICW. However we couldn't find the marks shown on the chart for the main channel. It was pretty clear that channel was permanently closed. There appeared to be a marked channel straight down to the Morehead City Bridge from our position near the closed channel. However my charts did not show a marked route under the bridge. I was not clear that we could get to the ICW channel under the bridge on this route. We saw a couple of large powerboats head down that channel, but they do not require the same vertical clearance or water depth as a sailboat. We continued around Radio Island into the harbor at Beaufort, contacted the Beaufort Docks and were in a berth by a little before 15:00. About the same time if we had waited for the 14:30 bridge opening. Anyway we arrived in time for Steve to clean up and grab his taxi to the airport in New Bern. Sarah in Beaufort Docks Sarah remained at the Beaufort Docks for about 10 days until Steve returned and we departed for the Bahamas. To follow the rest of the trip to The Bahamas in 2008, use the menu on the left or click here. In 2010 I brought Sarah north from New Bern, NC to the Chesapeake via the ICW. I had planned a leisurely cruise back to the Patuxent River, but a combination of Hurricane Earl and a badly swollen ankle motivated me to move more quickly. Earl turned out to be a non-event, my ankle was significantly more serious as it needed medical attention. So I used the relatively long days of late August to get north as quickly as possible. I expected the most difficult portion of the trip would be the ICW from Coinjock to Norfolk, primarily because of the number of bridges and their restrictive openings. I needed to get through the bridges in Chesapeake, VA before the evening rush hour closings took place. So I departed Coinjock just after dawn and headed up the ICW. Amazingly I was able to time my arrival at each bridge almost perfectly. I hit the North Landing Bridge right at it's opening on the hour and only had to slow down a bit to let the southbound traffic through first. It was nearly the same at the Centerville Turnpike Swing Bridge. At Great Bridge I had to wait about 10 minutes for the bridge opening as the noon-time traffic was fairly heavy. However, I was quickly moved through the lock and on my way. The next bridge was the dreaded Dominion Highway Steel Bridge. This bridge opens only on the hour. I arrived about 20 minutes early so the wait for the openning was not bad as it often is. The only remaining bridge between Sarah and Norfolk was the Gilmerton Bridge (shown on the right). This should be easy as it opens on demand, except during rush hours and when the Norfolk and Southern Railroad bridge is closed for traffic. I arrived at the bridge around 1430, well in advance of the evening rush hour closing and the railroad bridge was open. I contacted the Gilmerton bridge tender for an opening, but was told I should contact the vessel The Dove, which was southbound waiting for the next openning. I wasn't sure why that would be an issue. The only Dove I'm familiar with is the replica of one of the vessels that brought the early colonists to Maryland. If that vessel was waiting on the other side of the bridge it shouldn't be a problem for both of us the pass on a single bridge openning. Coal Carrier The Dove Entering the Gilmerton Bridge Well it wasn't that Dove. This was a large coal carrier that used nearly every inch of the horizontal clearance in the Gilmerton Bridge. In the picture on the left the bow of this ship has entered the bridge opening. You can also see the superstructure of the ship in the background behind the bridge. I was requested to stay well clear of the bridge and the coal terminal on the west side of the ICW where the ship would be berthed. In the picture on the right the ship is halfway through the bridge. The Dove Being Berthed at a Coal Terminal Amazingly only two tugs were required to maneuver this large ship through the bridge and secure it to the coal terminal. Once the ship was out of the channel I moved back up to the Gilmerton Bridge and requested another openning. Getting this ship through the bridge had taken almost a half hour and traffic was backed up on the road. I had to wait nearly another half hour before the traffic cleared enough to allow the bridge tender to re-open the bridge. I still beat the rush hour closing and now had no bridges between Sarah and my intended anchorage in Willoughby Bay. On the way up the Elizabeth River to Willoughby Bay I was passed by the two tug boats that had maneuvered the coal carrier. One is shown on the right. When it appeared the coal carrier had been berthed at the terminal I passed behind one of these tugs. Just then the tug gave the carrier another push and ran its engines to what looked like full power. The prop wash from that tug pushed Sarah about 15' to the right. Fortunately there was plenty of room on that side of channel, but it was exciting for a few moments.